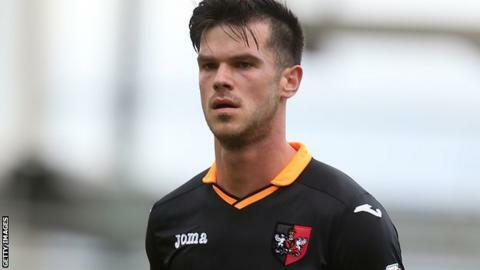 Torquay United could sign former Exeter and Woking midfielder Jimmy Keohane. The 24-year-old is a free agent after his short-term contract at Woking expired earlier this month and has been training with Torquay this week. "We're just having a chat with him and seeing where it takes us," Torquay boss Kevin Nicholson told BBC Sport. "He's local, he's hungry, he's everything you want, and having lost Simon Heslop there's probably a spot available in that position." The Irishman scored two goals in 15 appearances for fellow National League side Woking this season after being released by Exeter in the summer. He made 87 appearances in four years for Exeter City, scoring nine times after making his debut as a substitute against Premier League Liverpool in the League Cup in August 2011. "He's a good footballer, he's had a great upbringing, he's come through with Exeter, worked Paul Tisdale who's a very good manager, very good at developing players and Jimmy's been highly recommended by several people that I've spoken to," Nicholson added. Nicholson is hopeful that he can further add to his squad, either through a fifth loan signing or a free agent. "We're looking at forwards," he added. "The last two games with Cheltenham and Forest Green, Andre Wright and Tyrone Marsh ran themselves into the floor and when the time came when we needed to freshen things up we couldn't and they kept on going. "I think the difference between us picking up another three points over the Christmas period was the fact that we didn't have anybody to throw on there."